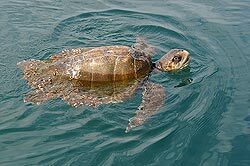 It can take many years for sea turtles to become sexually mature, for example, Loggerheads have to grow 30-50 years old before they can start breeding. Some species can live over 100 years. 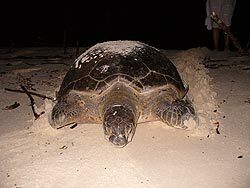 They then return to the land, the females drag themselves up the beach at night and dig a hole, using their flippers, above the high tide mark in which they lay about 50 to 200 flexible, leathery, ping-pong ball shaped eggs. After mating, the males return to their feeding grounds. 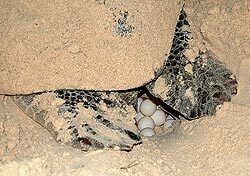 Once all the eggs are in the chamber, the mother turtle uses her rear flippers to push sand over the top of the egg cavity. Gradually, she packs the sand down over the top and then begins using her front flippers to refill the body pit and disguise the nest. By throwing sand in all directions it is much harder for predators to find the eggs. Females may return to the beach where they hatched. This can take place every two to four years after maturity. They make from one to eight nests per season. 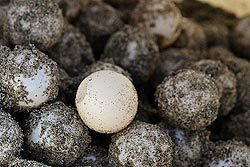 They cover the eggs and return to the sea, leaving the eggs to be incubated by sun. 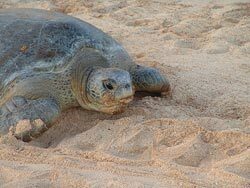 Predators such as goannas and feral pigs often dig up turtle nests and eat the eggs. the sea after laying her eggs. 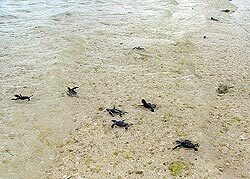 Flickr Instead of nesting individually like the other species, Ridley sea turtles come ashore en masse, known as an "arribada" (arrival). 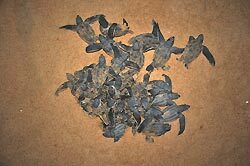 With the Kemp's ridley sea turtles this occurs during the day. 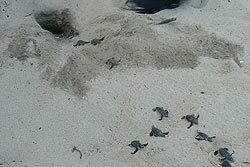 Two or three months later, the small baby sea turtles hatch over a short period of time and climb out of the nest. At sunset they run to the water, all at once to confuse the predators such as crabs, gulls and frigate birds. Flickr Even in the water they remain vulnerable for a long time as sharks and other predatory fish eat them. Flickr During its first critical 48 hours, a hatchling must travel from the beach to a place in the ocean where it is relatively safe from predators and where it can find food. 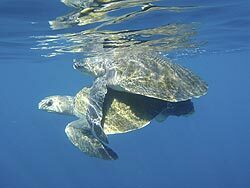 The juvenile turtles usually spend their first few years eating and growing in nearshore habitats..